Family stories add color to our picture of life in and around Byerazino. Matthew Elkin tells us that it is ‘a nice little town in summer and winter’ but not so pleasant in mud season. Dora Perress says that people sometimes wash their clothes in the river, while a man with a horse and wagon delivers buckets of water for bathing at home. Vast forests surround the town. Lee Korobok remembers riding through the forest in her grandfather's buggy when a wolf attacked the horse. Count Potocki, a Polish overlord, owns the town and all the land for miles around; families lease logging rights or work for the Count as foresters, turpentine makers, or in his liquor distillery. Zalman Buslovich tailors the Count's tuxedos; the Count intervenes when Polish soldiers capture Zalman's son. Hersch Rabinowitz supervises a crew of lumberjacks who camp out in the Potocki forest all winter. Israel Feldbin is not fond of the Potocki family: they try (but fail) to cheat him in a business deal. Young people manage to get ahead: Jeremiah Cherepacha completes religious studies and qualifies as a shochet, while also studying pharmacy at the town's gymnasium. Sidney Rabinowitz becomes a proud 'yeshiva bochur’ in Byerazino, although he comes from Pahost. Hyman Marron learns to be a skilled cabinetmaker. Jacob Zendel follows his father in the shoemaking trade. 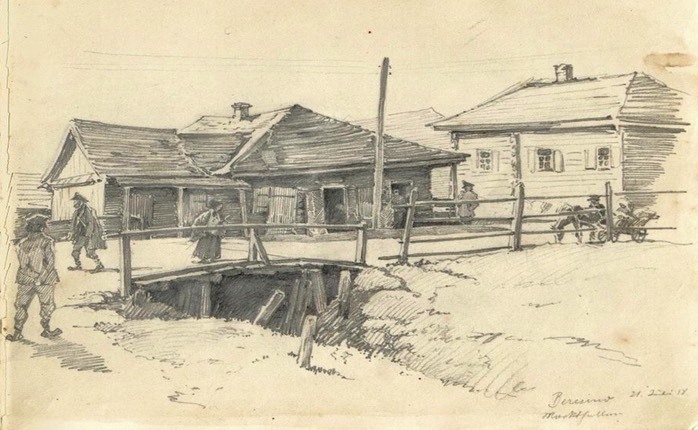 Aaron B. Rappaport describes his childhood in a tiny shtetl 10 miles northwest of Byerazino. Akiva Kagan’s family moves to Byerazino so their sons can get a good education. Shmarya Levin leaves his home in Svisloch to study at the Byerazino yeshiva. Ken Kahn and his cousin Emily Sper (Levin's cousins) contribute a chapter from Levin's autobiography, in which he describes his first "bitter taste of class distinction" (reprinted here with the kind permission of The Jewish Publication Society of America). Emigration begins in the 1880s. While the majority of immigrants head for the New York metropolitan area, as did the Charney family from Pahost, Rochester attracts many members of the Kugel family and the Zeldovich-Gurevich family. Often, as in the Chodosch family, the father travels ahead to prepare the way. Six orphaned brothers, the Rosoff boys from Borisov, emigrate one by one, each saving his dollars until he can buy a younger brother’s ticket. It is heartwarming to read of cousins, separated by emigration, who rediscover one another many years later, as happened in the Rafalchik-Rubenchik family, the Buslovich family, the Lifchitz-Starobinets family and the Zendel family. Sometimes a photograph provides the link, sometimes it is a special keepsake, like the matching plates given to each child in the Gutin family, or sometimes it is a shared memory or family story. The Russian Revolution of 1917 ushers in a period of lawlessness and civil war, during which rival armies battle and brigands take advantage of the ensuing chaos. Ruth Rabinowitz Losman remembers fleeing from the Bolsheviks. Sol Feldbaum loses his father and brother when Polish troops attack Pahost.